Professor Petrocelli of NYC Hypnosis Say: Utilizing Prayer And Hypnosis, You too can Attract Love And Prosperity Into Your Life! New York Hypnosis Prove Formula says, If It Worked For Him, It will work for you. Hypnosis And Hypnosis Principles have been proven. You’ve seen major athletes, criminals, the desperate, the poor, rise up from the depths of despair using the power of prayer. Well the power of prayer is the power of attraction, and that’s the underlying principle of Hypnosis says Professor Petrocelli. Those whom believe in a higher power, have faith in that higher power that through the power of prayer they will receive what they want or need in their lives, find that in many cases, not necessarily in the way they could have imagined it, but things happen, almost miraculously in their lives. If you believe yourself to be a rational, analytical person who doesn’t believe in the power of prayer (and most of our NYC Stop Smoking Clients have tried this), there is an actual, scientific reason prayer works, way beyond the ecsoteric principles for you to utilize the power of prayer in your life. Lets explore how it works. Believe it or now, Your mind is a goal seeking mechanism. You use these principles every day. Think about it. It controls the millions of minute, miniscule functions in your body at any given moment, helping you to survive, function and move throughout the world, healthy, and it runs successfully, without any intervention on your part. The principles of prayer: How It Works ! You focus on something you want in life. Maybe relief from bills, a new relationship, a new job, love in your life, relief from stress. You focus your mind on what you want. Secondly, since you’ve already conceded to your mind that you can’t achieve it by yourself or means under your power, you give it up to an outside source, whether it be God, Mohammed, Buddha, Krishna, the Saints, or whomever your faith believes would be the most beneficial. Okay, lets see what you’ve done .. You’ve given your brain a goal, an ideal outcome. You’ve prayed to your God. You’ve handed the problem over … no longer relying on your faulty psyche to achieve it. In that process, what you’re done is to release the negative thoughts (which become self fulfilling prophesys) that you can not achieve your outcome, you’ve dissapated them. It’s not your problem. Your worry. My God will help me. You’ve set that goal-seeking cybernetic device, the brain into motion doing what it does best, headed toward the target you have in mind. What happens next. Well .. Is it all fairytale happy endings? No! The brain will get you to that goal by hook or crook. It may not be the way you want it to. And at times, it may have to give you a good kick in the posterior to achieve that end. And this is where many do not understand the functionality of giving the brain a goal. It could mean leaving an unhappy relationship, quitting that unfulfilling job, it definitely means getting out of your comfort zone. You may find yourself in places you didn’t expect to be. Meeting people you didn’t expect to meet. Putting yourself out there. Open to new prosperity, new love, new feelings. Things happen magically in your life. Sometimes you wonder, if there is a god, why is this happening to me. But after the fact, and it might be something devastating, you find that you had to take drastic action to move from where you are to where you want to be and you can look back at it. But you have to be aware, the mind will help you achieve what you want, and what you want, may not be what you need. So add this little caveat when you pray: God, help me get this, or something better. Because that better relationship, that better job, may be right in front of you, unnoticed, and you’ll get what you focus on. At NYC Hypnosis Center, we help you formulate those goals into clear directives, freeing the mind of the negative thoughts that interfere with you achieving that success. Many have conflicting goals. Put two conflicting goals in one’s mind, and the mind creates confusion, forgetfulness, simple tasks backfire. Our S.C.R.I.P.T.S. method of goal driven hypnosis will empower your mind with the believe in change. Give us a call at our New York City Hypnosis center today and find out how you can achieve your dreams. 212 964 4450. Or give Brian a call at the New York Goal Hypnosis Center! Tags: become a hypnotist, hypnotherapy in new york, Hypnotist New York, mad russian hypnosis, where do I find a hypnotist in brooklyn, where do I find a hypnotist in queens. Filed under anger management with hypnosis new york city, best new york hypnotist, Hypnosis For Phobias In NYC, hypnosis new york for anger, Hypnosis Versus Rehabe, Hypnotherapy In NYC, New York Hypnosis, New York Hypnotherapy, New York Hypnotherapy for Panic Attacks, NYC Hypnosis, nyc hypnotist for alcoholism, quit drinking alcohol with hypnosis, quit smoking cigarettes with new york hypnotist, Stop SMoking Hypnosis by admin on Aug 2nd, 2013. Comment. NYC Hypnosis: The Law Of Success And Your Brain .. And Why You Need To Flip The Switch .. NOW ! – As Said By Dr. MattheW Maltz ! According to Dr. Matthew Maltz, author of the world famous, iconic classic self help book, Psychocybernetics, the brain is a cybernetic device, a self goal seeking mechanism. Dr. Maltz writes: There are two types of cybernetic mechanisms in artificial intelligence: One, which has a fixed target and cannot deviate from it’s course or direction. In this case, a missile launched will reach it’s targeted area, perfectly, even if the target it’s intended to make impact with, has managed to move. But it will still implode at the directed location. The other mechanism is a self correcting cybernetic device, which redirects the missile and keeps it on course by negative feedback and constantly redirecting it’s course toward the target. A good example is driving a car. You have a direction in mind. Which is The location you have planned to go to and will eventually arrive at, and yet, the road swerves and bends, objects float into your space you must slow up for (other vehicles, animals, accidents, traffic lights) … and you must gently make those subtle changes in direction (via steering, braking and acceleration) to keep your car on track. Give the brain two opposing goals (what some call a backup plan) to focus it’s massive internal resources on and it will achieve neither outcome. And the only way for the brain to avoid failure, causes the mind to go into a confused state or self correct in a manner which causes self sabotage. Why? Because it’s only following directions and now …there’s no clear cut unified direction or outcome. Opposing Outcomes: Self Sabotage Defined ! Don’t be the kind of person who gives themselves an out in life. “I’m going to try this. If I fail in this goal, or this career, or my dream doesn’t work out, I’m going to remain in this job for the rest of my life.” Since the mind is a goal seeking mechanism, the mind no longer has a serious outcome as it is being forced to focus it’s vast subconscious resources are two competing (for some, it’s more), different outcomes. When this happens as one area of their life comes close to an outcome, most people will experience forgetfulness, confusion, as the mind will devise a clever strategy of ‘reblaming’, finding fault in other areas or with others, not of their own design to as the brain goes into ‘protect’ mode to protect the subconscious cybernetic system . The brain will sabotage any chances of success in either outcome, because the mind being success-orientated, achieving success in this case means failure in the secondary outcome. Major Military and Ultimately successful organizations thoroughly understand these principles and how focusing on two competing outcomes or strategies simply means, NO GOAL. When the military designs a system, or when they plan a secondary backup plan, it is given to a totally separate department or organization to devise. No knowledge of this secondary backup or of it’s existence is given to the primary department or organization as that knowledge would contaminate their outcome. Simply having the knowledge a secondary plan exists, military strategists admit, immediately destroys the urgency of the primary plan to succeed. Ultimately, what goes for the primary strategy goes for the backup plan. The secondary organization or department is given no knowledge of the first plan. Matter of fact, they may not even be aware they are not working on the primary plan or outcome in the first place. To come up with a truly unique outcome, they have to look at the problem with a clean slate. Only then can they create a solution that doesn’t rely on what hasn’t worked in the past. Do you find, maybe good intentioned, you have given your brain multiple outs, multiple directions which are sabotaging your success. History has proven this theory time and time again. Liken the brain to a captain on a ship. There can only be one captain, one resolve, for the crew to have faith they will reach their destination. When competing leadership comes into effect, it’s called mutiny. Leading new age brain researchers liken the brain to a computer in functionality. One new piece of information added to a software program, one conflict, destroys the entire program. It will either stop running, or spit out faulty (wrong) information, and it keeps on running, well, I’m sure you’ve heard it before from a non computer literate customer service rep when trying to solve a problem on your account: “Sir, this is what the computer says.” …. Even though you understand the information is faulty, now you go through the lengthy process of rectifying errors on their end. Think of your brain like a computer! Two conflicting goals, and it will create conflict, whether it’s on your job, in your relationships. The brain will put you in situations where you cause yourself to self sabotage, forget information and then, in it’s glorious self directing inherent ability, cause you to justify your actions and blame others while and while you allow those beliefs, it creates those beliefs as actual constructs which lead many into a cycle of a self inflicted thought pattern, like a Gerbil chasing it’s tail in a wheel, never really going anywhere, but always running in the only direction it can. Hypnotherapy will help you align your thoughts. Give you a clear cut direction to ‘What You Want.” You will look at things with a new freedom as a mind ‘directed’ easily achieves outcomes. A mind misdirected just wanders aimlessly. Give us a call at the NYC Hypnosis Center. Direct your mind and achieve a new freedom in thought, goals. Call 212 964 4450. It’s the same with the human brain, give the brain two opposing goals (what some call a backup plan) to focus it’s massive internal resources on and it will achieve neither outcome. And the only way for the brain to avoid failure, causes the mind to go into a confused state or self correct in a manner which causes self sabotage. Why? Because it’s only following directions and now …there’s no clear cut unified direction or outcome. Many people give themselves an out in life. “I’m going to try this. If I fail in this goal, or this career, or my dream doesn’t work out, I’m going to remain in this job for the rest of my life.” Since the mind is a goal seeking mechanism, the mind no longer has a serious outcome as it is being forced to focus it’s vast subconscious resources are two competing (for some, it’s more), different outcomes. When this happens as one area of their life comes close to an outcome, most people will experience forgetfulness, confusion, as the mind will devise a clever strategy of ‘reblaming’, finding fault in other areas or with others, not of their own design to as the brain goes into ‘protect’ mode to protect the subconscious cybernetic system . The brain will sabotage any chances of success in either outcome, because the mind being success-orientated, achieving success in this case means failure in the secondary outcome. The Military and Major successful organizations thoroughly understand these principles and how focusing on two competing outcomes or strategies simply means, NO GOAL. When the military designs a system, or when they plan a secondary backup plan, it is given to a totally separate department or organization to devise. No knowledge of this secondary backup or of it’s existence is given to the primary department or organization as that knowledge would contaminate their outcome. Simply having the knowledge a secondary plan exists, military strategists admit, immediately destroys the urgency of the primary plan to succeed. And what goes for the primary strategy goes for the backup plan. The secondary organization or department is given no knowledge of the first plan. Matter of fact, they may not even be aware they are not working on the primary plan or outcome in the first place. To come up with a truly unique outcome, they have to look at the problem with a clean slate. Only then can they create a solution that doesn’t rely on what hasn’t worked in the past. Tags: anger management specialitst, become prosperous with hypnosis, carmel new york hypnosis, connecticut hypnosis, doctor who hypnotizes, Hypnosis New York, mad russian stop smoking, new york hipnotism, ny hipnotist, stress management, the mad russion hypnotist, warwick new york hypnosis, weight loss hypnosis, where is the mad russian, windsor hypnosis. Filed under anger management with hypnosis new york city, best new york hypnotist, hipnotism for weight loss in new york, Hypnosis for alcohol beats A.A. Meetings, Hypnosis For Phobias In NYC, hypnosis new york for anger, Hypnosis Versus Rehabe, Hypnotherapy In NYC, hypnotist new york, New York City Hypnosis, New York Hypnosis, New York Hypnotherapy, New York Hypnotherapy for Panic Attacks, New YOrk Hypnotist for weight loss, NYC Hypnosis, nyc hypnotist for alcoholism, quit smoking cigarettes with new york hypnotist, Stop SMoking Hypnosis by admin on Aug 1st, 2013. Comment. NYC Hypnosis Fact File: Anger Management Techniques Don’t Work! Hypnosis Does. Find Out How! NYC Fact File: Anger Management Doesn’t Work! Managing Your Anger isn’t what you want. Alleviating your anger is the key. And you can do it! With hYpnosis. Find out NYC Hypnosis Secret Method, honed in the financial district. Anger Can Rears It’s Deadly Head … and you know what it’s like .. because Sometimes you feel trapped, out of control, don’t you …….. There comes a point when you’re in too deep. The original reason for the anger, is no longer relevant and you’re operating out of pure instinctual rage… A Pure primal response .. and that anger, not only is dangerous to your loved ones .. but it can get you locked up … but also eats away at your instestines. It’s Corrosive . Think Ulcers, IBS – Irritable Bowel Syndrome, Skin eruptions, digestion problems. When you CAN’T CONTROL THE STRESS .. like a nuclear plant reaching meltdown, no one is going to talk you down. An anger management class? You’ve seen the movies making fun of them. Who wants to MANAGE ANGER in the first place. NYC Hypnosis at our New York City Hypnosis Center will help you to take the lid off that purculating anger time bomb in your system by leading you through an effective, emotional stabilizing process … a way of of changing those stimulai, which like a ticking time bomb lead to unproductive and uncontrollable responses and transform them into a more relaxed, acceptable, regulate-able emotion .. where you have your emotions under control … which you don’t regret later. Call our New York hypnosis Center now … Before Its too late. See if you’re a candidate. Tags: best hypnotist in ny, getting over anger with hypnosis nyc, hypnosis to stop smoking in new york city, New york Hypnotherapy, new york hypnotist for anger management, nj and connecticut, NYc Hypnosis For Anger Management, NYC Hypnotist, who is the best hypnotist to help me stop smoking in new york. Filed under anger management with hypnosis new york city, best new york hypnotist, hipnotism for weight loss in new york, Hypnosis For Phobias In NYC, hypnosis new york for anger, hypnotist new york, New York Hypnosis, New York Hypnotherapy, NYC Hypnosis, nyc hypnotist for alcoholism, quit smoking cigarettes with new york hypnotist, Stop SMoking Hypnosis by admin on Jul 24th, 2013. Comment. NYC Hypnosis For Weight Loss Immediately … Climb On .. Reach Your Goals! It’ Works! New York city Hypnosis works quickly and easily for weight loss. Many of our clients find willpower and simple desire aren’t always enough to move you along on your weight goals. Soon, years blast by, it is no longer days, but months, years have gone by and you have only become heavier. Hear New York Hypnotist explain Hypnosis The New York Method. Our New York Hypnotists offer service that gets powerful positive results. Tags: best new york city hypnotist, hipnosis, hipnotism are all common mispelling nys, hipnotism in new york, how do i find a new york city hypnotist, hynotis, new york hypnosis forj relationship issues, new york hypnosis to stop smoking, NYC Hypnotist, who's the best in new york city for hypnosis. Filed under Hypnosis For Phobias In NYC, Hypnotherapy In NYC, hypnotist new york, New York City Hypnosis, New York Hypnosis, New York Hypnotherapy, New York Hypnotherapy for Panic Attacks, NYC Hypnosis, quit drinking alcohol with hypnosis, quit smoking cigarettes with new york hypnotist, Stop SMoking Hypnosis by admin on Jul 22nd, 2013. Comment. New York City Hypnosis: How The Power Of Prayer Works – For The Non Believer ! If you believe yourself to be a rational, analytical person who doesn’t believe in the power of prayer, there is an actual, scientific reason prayer works, way beyond the ecsoteric principles for you to utilize the power of prayer in your life. Lets explore how it works. Your mind is a goal seeking mechanism. Think about it. It controls the millions of minute, miniscule functions in your body at any given moment, helping you to survive, function and move throughout the world, healthy, and it runs successfully, without any intervention on your part. You focus the infinite power of your mind on something you want in life. Now … this may be relief from bills, a new relationship, a new job, love in your life, relief from stress. You focus your mind on what you want. Secondly, since you’ve already conceded to your mind that you can’t achieve it by yourself or means under your power, you give it up to an outside source, whether it be God, Mohammed, Buddha, Krishna, the Saints, or whomever your faith believes would be the most beneficial. FOR THE SKEPTIC ! READ THIS ! Tags: can prayer help me, how do I focus on my goals, how do I pray, Power of prayer used in hypnosis, will hypnosis help me. Filed under Hypnosis For Phobias In NYC, Hypnotherapy In NYC, New York City Hypnosis, New York Hypnosis, New York Hypnotherapy, NYC Hypnosis, quit smoking cigarettes with new york hypnotist, Stop SMoking Hypnosis by admin on Apr 14th, 2013. Comment. NYC Hypnosis For Phobias And Anxiety: How It Works! How You Can Feel Good Forever! NYC Hypnosis: How Hypnosis Can Help With Anxiety And Phobias EASILY ! 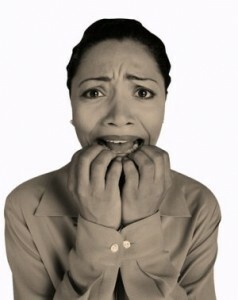 A Phobia is a n irrational fear .. a fear of a fear ….. of a specific object or situation. It could be a phobia of bugs, spiders, heights, elevators, giving blood, getting an injection for a doctor, going to your dentist, being in a crowd ….. and this fear when no fearful situation is actually present is excessive, unreasonable, irrational, and exaggerated. When you have a phobia … or a phobic response as it is called, your anxiety is triggered by either a presence or a thought, but more than likely, the anticipation of the feared object or situation, eg. Someone says there’s a spider. Your anxiety response spikes and interferes with your normal functioning, productivity. Devastates the enjoyment of your life. You live in fear of the experience. You avoid certain places, certain actions. When you are exposed to the phobic stimulus , what occurs is an immediate anxiety response, which can take the form of a Panic Attack (DSM-IV-TR). As a result, you begin to avoid the phobic situations, because if exposure does happens, you go through the situation anxious. What plagues most New Yorkers is called “Social Phobia”. Where you have a marked and persistent fear of one or more social or performance situations in which you are exposed to people you are not familiar with or you think you will be judged (DSM-IV-R). You have this underlying, heart throbbing fear that you will act in such a way that will humiliate or embarrass you. Phobias are negative ways of coping with situations that have created exaggerated, unproductive responses and have evolved in an attempt to reduce anxiety. The S.C.R.I.P.T.S. Method of Phobia Removal is to get to the root of the problem and to dissapate the underlying anxiety taping into the creative powers of the imagination to rescript the attached emotional response that causes you to have an anxiety reaction. This approach changes the symptoms where your mind visualizes these past memories as a learning experience with the new feeling of choice installed. You feel good. After a while, many of our clients forget they had a problem in the first place. The old saying, “Out of sight … out of mind” as you live your life to your full potential. Our Hypnosis Sessions at Professor Petrocelli’s Original NYC Hypnosis Center are biased toward achieving the results you want. We don’t DO HYPNOSIS … we create changes. Changes that are productive, powerful and basically, give you the freedom to live your life focused on the core values of Freedom, Happiness and Purpose. Give us a call 212 964 4450 …. Find out your next steps are to living a fully empowered life, confidentially, reassured with a new vigor and optimism. No one cares about your health as much as you do. Tags: New York Hypnosis For Stress Control, NYC Hypnosis For Panic Attacks, NYC Hypnosis For Phobias, NYC Hypnosis For PSTD. Filed under Hypnosis For Phobias In NYC, Hypnotherapy In NYC, hypnotist new york, New York City Hypnosis, New York Hypnosis, New York Hypnotherapy, New York Hypnotherapy for Panic Attacks, NYC Hypnosis, Stop SMoking Hypnosis by admin on Apr 9th, 2013. Comment. New York City Hypnosis: Hypnosis In New York Reveals Fashion Diet Plan Using The Mind! It Works ! New York City weight loss hypnosis, will it work? Is it just a placebo effect? Simply Close your eyes … Now! . Imagine your food cravings … gone from your mind .. gone from your body … Imagine a mindset where you eat only what’s good for you. Imagine Nyc hypnosis mind repatterning techniques are actually helping you lose weight—because, and our thousands of clients will back us up – It does. When clients come to the NYC Hypnosis Center —they ask: Does Hypnosis work? The answer get them so enthralled s with something between excitement and incredulity. Most weight loss try-ees, don’t realize adding NYC hypnosis to your regimen, changes your mind set to help you lose more weight and keep it off longer. Hypnosis is an effective weight loss strategy. Hypnotic studies have shown that weight loss applicants who learn self-hypnosis lost twice as much weight as those who didn’t (and, in one study, kept it off two years after treatment ended. And yet, hypnotherapy has remained a well-kept weight loss secret. Seeing the pounds melt away is definitely believing. The hypnotic true-isms that follow contain some of the diet-altering suggestions weight management clients receive in group and individual hypnotherapy. 1. Like the bible says, The answer lies within you. Our NYC Hypnotists believe you have everything you need to lose weight. You don’t need another crash diet or the latest appetite suppressant. Dropping unwanted pounds and inches is about trusting your mind’s incredible focusing abilities. 2. The Proof is in the Pudding, or as they say, Believing is seeing. The mind achieves what one thinks they can achieve. That even applies to hypnosis. If you believe hypnosis will work … it WILL WORK as our NYC Hypnosis Clients have proven time and time again. 4. If you build it .. they will come … If you can imagine it, it will come. Visualizing being at the proper weight readies you for a slimming reality. Imagining a day of healthy hypnotic eating helps you envision the necessary steps to becoming that healthy eater. Go ahead: Find an old photograph of yourself at a comfortable weight and remember what you were doing differently then; imagine going back to those routines that worked. Or Future Project: visualize getting advice from a future older, wiser self after she’s reached her desired weight. 6. Combine it with Exercise … even your weight watchers meetings. . Clients lose twice as much weight without falling into the dieter’s lose-some, regain-more trap if you combine it with something that worked in the past. 7. Increment changes …. Don’t eliminate completely … Regulate. : Modify your highest- calorie craving. Instead of a pint of Ben and Jerry’s, how about a cup of greek yogurt? 8. The body will FIGHT FOR SURVIVAL. Starvation Programs are OUT ! They don’t work for long term benefit. 9. Reprogram … Reprogram … Reprogram .Silently repeating and visualizing your dynamic positive outcome,10 minutes daily can transform your eating, especially when combined with slow, natural breaths, typical of any behavioral-change program. 10. When you relapse. You can learn from a real or imagined relapse— why it happened, how to handle it differently—you’ll be better prepared for life’s inevitable temptations with our new york hypnotists suggestions helping you to move forward. Tags: Can Hypnosis Help Me With Anger, how can I lose weight with hyponosis in new york city, Hypnotist in NYC for stomach problems, New York Hypnosis Training. Filed under Hypnotherapy In NYC, hypnotist new york, New York City Hypnosis, New York Hypnosis, New York Hypnotherapy, NYC Hypnosis, quit drinking alcohol with hypnosis, quit smoking cigarettes with new york hypnotist, Stop SMoking Hypnosis by admin on Feb 28th, 2013. Comment. New York Hypnosis Hypnotist Brian Says Your Children Can Be Helped – Without Drugs! New York City Hypnotist Brian K, says, using hypnotic and persuasive languaging patterns, he’s helped thousands of students improve their self esteem, help students learn faster and keeps discipline and respect in the classroom. Why aren’t these techniques already being used in the classroom? ‘Frankly,’ said Mr. Kastan, ‘Because outside of studing hypnosis, persuasion techniques culled from lawyers, television, the media, there is no one out there teaching these techniques. They are effective. They work in the classroom, and with my 1 and 2 year old children.They will work for you,” claims educator, hypnotist, author Kastan. Shelly Fagin, a happy mom who’s seen Mr. Kastan for issues with her 9 year old son said, “It’s a shame. No one teaches us how to talk to our children. Tags: Can Hypnosis Help Me With Anger, flatulence NYC Hypnosis, how to stop smoking with hypnsois new york, Irritible bowel syndrome and hypnosis New York, New York city Hypnosis, New York Hypnotist, nyc hypnotherapy. Filed under Hypnotherapy In NYC, hypnotist new york, New York City Hypnosis, New York Hypnosis, New York Hypnotherapy, NYC Hypnosis, quit drinking alcohol with hypnosis, quit smoking cigarettes with new york hypnotist, Stop SMoking Hypnosis by admin on Feb 25th, 2013. Comment. About New York City Hypnosis Center And Shauntay W.